Buying a home on a single income isn’t easy. Whether you have a family or partner cohabitating with you. or plan to live solo, there’s a lot to think about. Don’t rule out buying a home on a single income. Learn the facts and what you can afford. Work to improve your credit-worthiness. Explore special programs. And seek advice from pros like a trusted real estate agent, lender or property attorney. Want some extra advice on this topic? Read on for tips and observations offered by famous financial experts. Rinomato said single women in many situations are buying homes today. These include women who are divorced or separated. Also, “women who have focused on their career and didn’t have time for a relationship.” And women who just want to put off marriage or aren’t ready to sign on the bottom line with Mr. Wrong. But you need to do your homework when buying a home on a single income, she added. You may need to forgo some preferences, too. Personal finance expert Suze Orman knows that a lot of people are buying a home on a single income. That includes singles who plan to live alone. 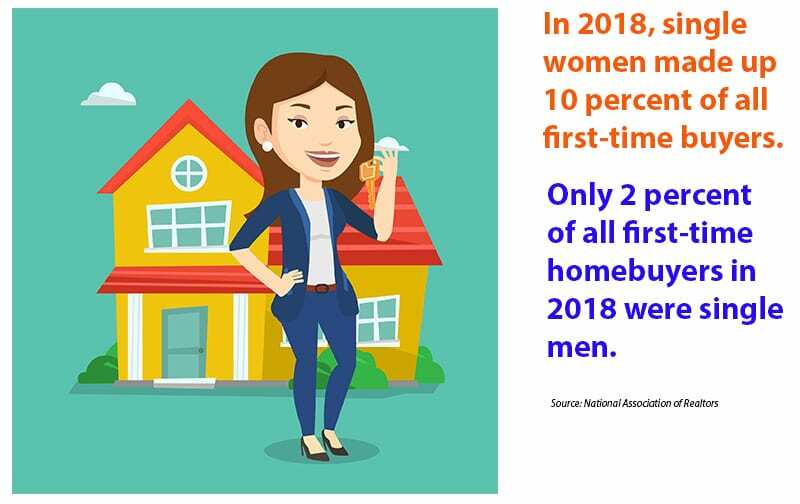 For proof, consider that single women own about 22 percent of homes; and single men own less than 13 percent (Source: 2017 American Community Survey). Together, they make up over one-third of all buyers. Ralph DiBugnara with Residential Home Funding is often quoted in the media. Recently, he gave a MarketWatch interview with tips for single buyers. “A growing trend among home buyers with limited means has been buying older properties and rehabbing them,” he said. DiBugnara also mentioned a few mortgage products worth pursuing on a single income. Millennials comprise one-quarter of home buyers. Many of them are buying a home on a single income. Yet not enough are taking the plunge. So says bestselling personal finance author David Bach. “The biggest mistakes millennials are making is not buying their first home. If you want to build real financial security, real wealth for your lifetime, then you need to buy a home. Homeowners are worth 40 times more than renters,” Bach said in a 2018 video. “That first home doesn’t need to be a dream home. It can be a very small home. You might literally have to buy a small studio apartment. But that’s how you get started,” he added. Here’s Bach’s secret to buying successfully, whether you’re solo or not. Buying a home on a single income is doable. In fact, well over one in three buyers go it alone on a mortgage. But know what you’re getting into first. Crunch the numbers. Forecast future costs and savings. Also, plan for changes down the road. You may end up buying anew or refinancing with a co-borrower partner to come. Just keep a close eye on finances. And don’t let housing costs overwhelm your budget.